Events in the life of Thomas Russell, Mayor of Springdale, a small town in Ohio. Also featured are The Mayor's housekeeper Marilly, his secretary Minnie, and his nephew Butch. The episodes have been arranged according to how they were shown on local TV stations. Please see the "Air-dates by City" section below for more details. The mayor defends a 17-year old boy accused of stealing a car, even though the mayor's political standing is put in jeopardy. For the first program, the mayor gives a high school reporter a good chance to see the wheels of her town's city hall set in motion. 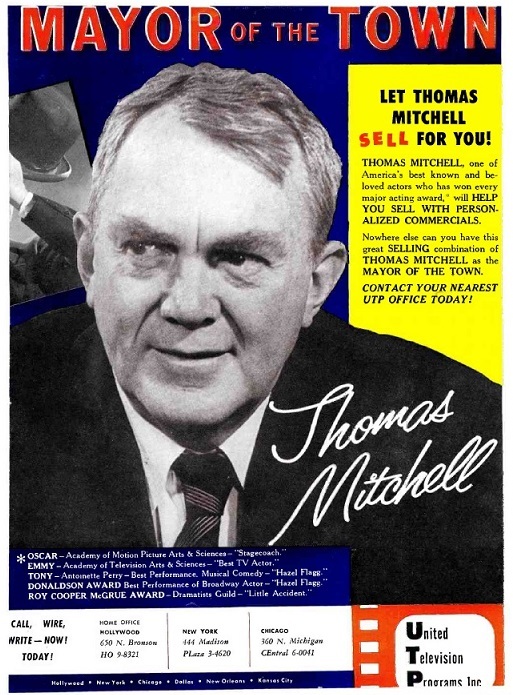 HIS HONOR - Thomas Mitchell brings to life and TV the role of "Mayor of the Town" that was created for radio by the late Lionel Barrymore. the truth of the matter and things get straightened out O.K. The Mayor of Springdale is almost put out of office when he refuses to buy buses and then takes up with a tramp. The Mayor has troubles as a matchmaker in "Mayor Plays Cupid." Once again the Mayor is at loggerheads with Joe Ainsley over how city funds should be spent. Mayor proposes traffic plan that people ignore until tragedy strikes. [--] Mayor of the Town: possibly "Take Me Out to the Ballgame." The "house overrun with children" description might be a sub-plot for show 1.08. 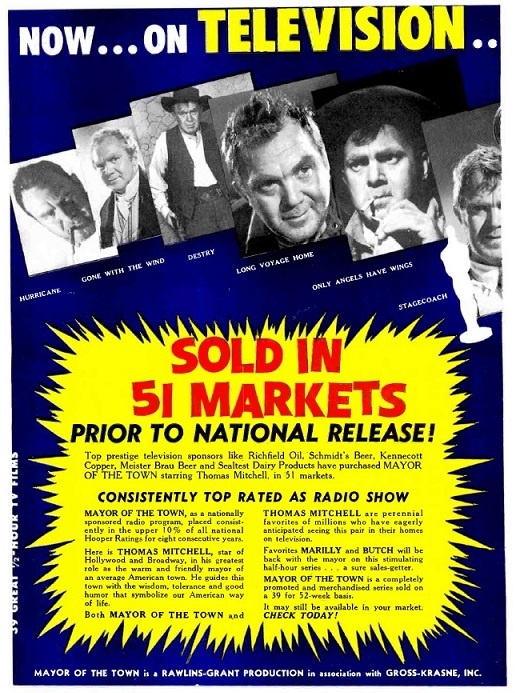 Based on the episode order for KTTV-11, 14Mar56 should be "Take Me Out to the Ballgame." Marilly (Kathleen Freeman) befriends a beautiful but brainless bride (Betty Lynn). 13Nov55 Kansas City, MO, Sun. The Mayor works out a plan to make Butch spend more time on his homework. Russell opposes a movie company's plan to hold a "Papa Dear" contest in Springdale. Butch and his buddies "haunt" city hall. The "airport expansion problem" synopsis might be a sub-plot for show 1.17. Based on the episode order for KTTV-11, 23May56 should be "City Hall Ghost." Russell defends an old watchmaker accused of theft. The Mayor comes to the rescue of the town's oldest watchmaker. Russell catches a cold and stays home to work on a rezoning problem. The Mayor is set for a happy birthday but the police kind of spoil things when they get suspicious of Marilly and Butch. Mayor protects newcomers from hostility. His household misunderstands when the mayor solicits funds for an impoverished law student. Everyone assumes the mayor's broke when he starts raising money—for a poor law student (Craig Hill). Marilly offers to mind a friend's baby while Buster Brown, the mayor's ailing friend, is staying at the house. Butch is elected "Mayor for a Day." The Mayor aids an auditor suspected of embezzlement. The mayor uses a popularity contest for quite another reason. The court's new marriage relations advisor turns out to be a single lady who's determined to marry the mayor. The Mayor finds he is about to entertain the governor and his wife … alone … after Marilly leaves the house in a huff. Mayor helps old couple regain financial feet. The mayor helps an elderly couple get started in business so they can move back to their farm. Marilly is outraged because her "dearest friend" presents her with an old teapot she must have found around the house. Marilly throws the teapot away, little knowing that a valuabe diamond ring hat been put in the teapot for safe keeping. HOLLYWOOD, July 31. - "The next five "Mayor of the Town" telefilms go into production at California Studios August 9. Titles set this week for the slate include "Next Time Take the Bus," "Love Is So Young," "The Baseball Story,"
"Marilly's Brother," and "The Halloween Story." by writers Erna and Milton Lazarus, and Otto Englander. "The Baseball Story" probably became "Take Me Out To The Ballgame." "Marilly's Brother" is probably "The Mayor Plays Cupid." No telling what became of "The Halloween Story" as none of the completed episodes seem to have a Halloween storyline.